I love trying the limited or private bottlings, rare whiskeys and barrel strength offerings, not to mention craft whiskeys. However, as young as this blog is (and with as many whiskeys out there that I have never tried) I feel the need to still make my way through the standards. Larceny, to me, is one such "standard," being readily available in nearly any grocery or liquor store, and incredibly affordable at around $21.00. 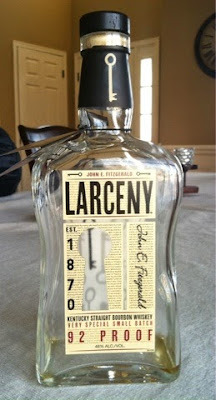 Larceny, a product of Heaven Hill Distilleries, is a wheated bourbon, described as "very special small batch" (somehow distinguishing it from every other bourbon that calls itself "small batch") and weighs in at 46% ABV. The nose of this bourbon is not strong. It has the standard vanilla and toffee notes to it, but nothing about it really stood out. The first pour, quite frankly, pretty much followed suit. It's a thin, watery bourbon, lacking any substance. The flavor is likewise not strong. What is there is good. It had the standard vanilla, toffee and brown sugar flavors with a soft smokiness that I really liked. It was a little spicy on the back end as well, though I could have gone for a bit more spice. After a couple weeks of being open, the flavor profile didn't really change much (and I didn't really expect much change with this one), but it did take on a more bread-like profile up front, which I found surprising and enjoyable and was perhaps the reason I ultimately kept going back to the well. Ultimately this is a soft, easy to drink bourbon, with good flavor. That flavor is muted, though. If Larceny provided a more robust version of this bourbon, I'd imagine that would be something I would really enjoy. It would certainly serve a s a good mixer, though, where you might not want the bourbon flavors to overpower your drink.